The babies and their parents were impressed with the number of different features: the chewy tab, the rings, the crinkles, jingles and different textures. 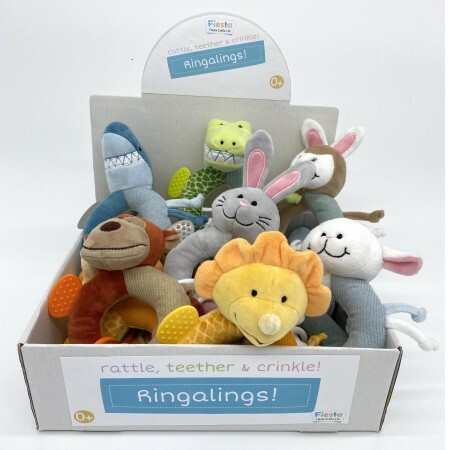 These are excellent for stimulating babys early touch and hearing senses, and parents felt it held their childs attention for longer than usual due to the fact there was lots to explore; they were immersed in shaking, squeezing, shaking and chewing the toy to see what would happen. The size and shape was perfect for little hands (strengthening small hand muscles) and the integrated teething piece meant babies could ease their sore gums and emerging teeth. The rattle encourages larger movements, which strengthen babys arm muscles and coordination too. Parents also really appreciated being able to machine wash the toy, to quickly get rid of all that teething dribble!